Resist the urge to turn and run—that might prompt the dog to pursue, a race the dog almost certainly will win. Instead, break off eye contact with the dog—eye contact increases the unease of some agitated dogs. If you see that the dog’s owner is nearby, stand still and wait for the owner to restrain the pet or calmly call to the owner if he/she appears unaware. If the owner doesn’t seem to be nearby, slowly back away. If possible, back away in a direction that opens up an obvious escape route for the dog, decreasing any sense that the dog has of being cornered. If the dog has you cornered and you can’t back away, slowly and calmly walk sideways until you’re in the open. As you back away, keep your hands low and open, with your palms facing the dog. Some dogs interpret fists or hands above the dog’s head as threats. You can try talking to the dog in a calm, low and relaxed tone—your tone is more important in this situation than what you say. Warning: A wagging tail does not always signal a friendly dog. A rapid, staccato wag often indicates nervousness, which could suddenly become aggression. Other potential signs of a nervous dog include ears pinned back…tail tucked between the legs…and/or a low, barely audible growl. If your dog is on a leash when it becomes aggressive, slowly and gently (but firmly) pull it to your side while speaking calmly. Do not yank the leash or yell at your dog—that could increase your dog’s stress level and aggressiveness. If your dog is not on a leash, call the dog to you. To increase the odds that the dog will come to you, get in the habit beforehand of providing a small treat each time it comes when called. If your dog doesn’t come to you, walk slowly and calmly to it and take it by the collar, attaching the leash if you have it. Do not rush at your dog or yell at it to stop—these signs that you are anxious will only add to your dog’s anxiety. 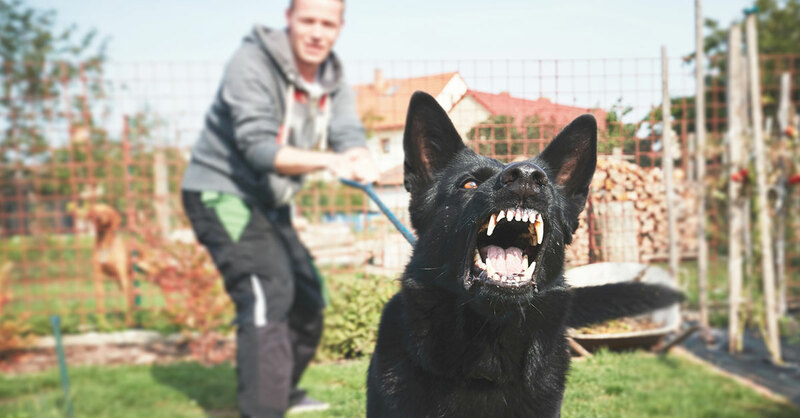 If your dog frequently is aggressive, find a trainer to help you and the dog learn to control this behavior.